The T302-120V-T1 is a class D, dual channel, 300W total, 70V power amplifier card used in the TitanONE T112 Smart Amplified Mainframe System. Any card may be placed in any slot in the mainframe without requiring any configuration settings to be made on the amplifier cards. This card is designed for use in 110V ~ 120V AC electrical countries. Switch-mode operation combined with high voltage power MOSFET devices make it possible to eliminate the heavy, costly, bulky transformers. The card contains no onboard attenuation controls. Attenuation is handled ahead of the power amplifier by the mainframe central processor. The power amplifier has built-in voltage limiting to protect the speakers. In addition, a temperature sensor on the heatsink will automatically shut down an amplifier that becomes too hot to protect the electronics. When used with the TitanONE T112, the amplifier status signals are monitored by the main control processor. Any failures are detected and reported to the IED supervision system to alert the user that service is required. The amplifier card has LED indicators located on its front edge. A single green LED will illuminate to indicate that the amplifier is powered on. Each channel on the card also has a multi-color signal LED. It will illuminate green when input signal is present on the channel. This LED changes to yellow to indicate that the channel is clipping. A power switch is provided on the front of each card. It is recessed and requires a tool to operate in order to prevent any accidental switch operation. 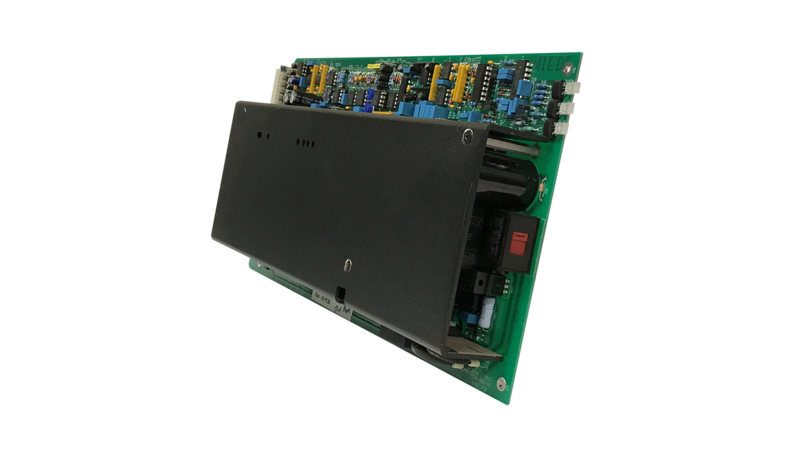 The switch allows an individual card to be powered down and removed or replaced without affecting any other cards installed in the same mainframe. Each card provides +24VDC through current limiting resistors to operate of the fans in the rear of the mainframe.